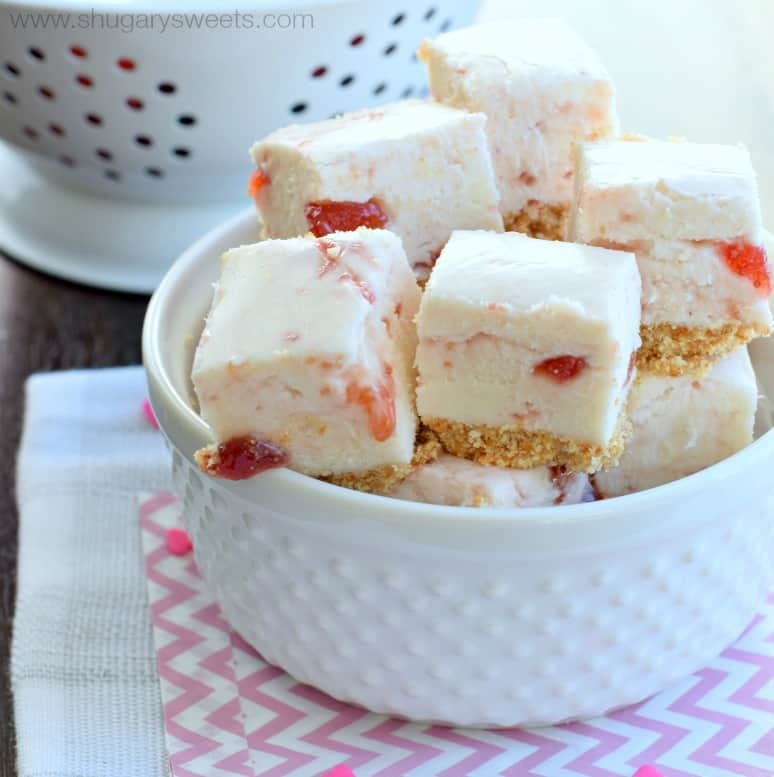 This sweet Strawberry Shortcake Fudge recipe is a knockout! Perfect for your next dessert. You would think hearing that, she did something cute with food. Right? Oh no. She was such a little trouble maker in her early years! So much so that if you asked her what her name was she would say “Trouble.” Yeah, it was cute, but wow, she was a handful. But, back to the “incident.” My husband and I had been working hard painting and decorating my craft room. We would put the kids down to bed, then stay up late painting. There was one evening, we had just finished the room and we were exhausted. In our exhaustion, we made a fatal flaw. We left out our supplies and went to bed. The next morning, chaos struck. Well, actually it was like most mornings. I had to get my older two up and ready to leave for school (they were 6 and 8 at the time). I also had a one year old I was feeding and getting dressed and ready to leave for Bible study. My middle daughter, “Trouble,” took this moment to check out the craft room. And in a span of 3 minutes, added her own artwork to the walls with the open paint. Where does the Strawberry Shortcake come into the story you ask? Well, we did think we were smart by at least putting away all the paint brushes. But my daughter was a tad smarter than us. She dipped her strawberry shortcake doll (hair first) into the leftover paint and used her doll as a paint brush. Bright orange paint on our white bead board. She made a mess. I arrived (ON TIME) to my bible study group that morning with a 3yr old wearing a shirt covered in orange paint, both of us needing prayers! Now my daughter is turning 13 and that story just brings a smile to my face every time I tell it. 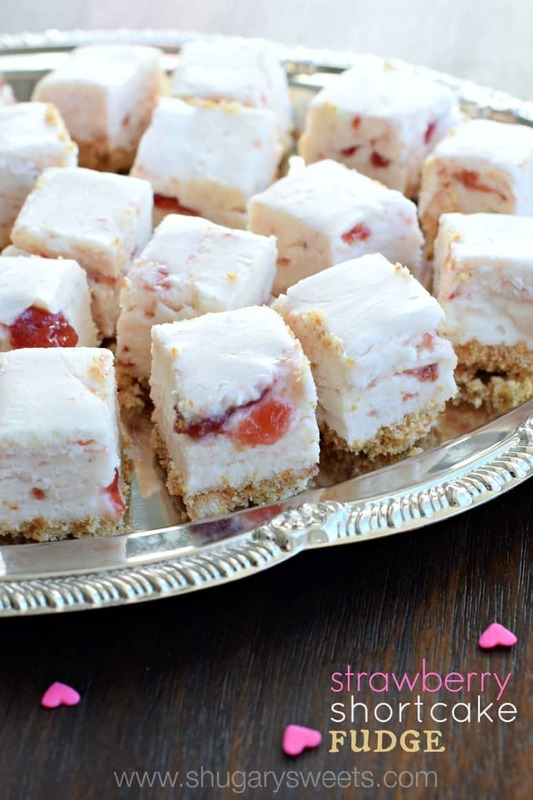 And today’s Strawberry Shortcake Fudge is a sweet tribute to all those sweet trouble makers! I used Nilla Wafers to make the crust on today’s fudge, but feel free to use Golden Oreos or shortbread cookies. Keep the fudge in the refrigerator until you’re ready to enjoy! 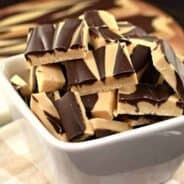 I’m the candy contributor over at Food Fanatic. 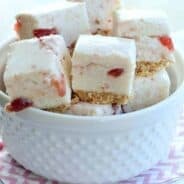 Be sure to print out this Strawberry Shortcake fudge recipe for later and check out my guide for more tips on how to make fudge! Line a 9-inch square dish with foil. Set aside. In a food processor, pulse cookies until fine crumbs. Add melted butter and stir until combined. Press into bottom of prepared dish. In a large mixing bowl, add white chocolate chips and marshmallow cream. Set aside. In a large saucepan, combine sugar, butter, salt and cream. Heat over medium high heat, stirring constantly, until mixture begins to boil. Continue boiling for 4-5 minutes (at a rolling boil). Remove from heat and pour over chocolate chips and marshmallow cream. Using an electric mixer, beat mixture until white chocolate chips are melted and fudge is creamy (about 1-2 minutes). Add strawberry preserves and stir gently until swirled in. Pour over crust. Refrigerate fudge for 4 hours. Cut and serve! Haha I love this story!! And this fudge, too. Perfect for Valentine’s Day or for the upcoming spring I’m craving so badly! I’m sure it wasn’t funny at the time, but I love hearing family stories like this! I’m glad that story brings a smile to your face now. When I was little my mom called me “Menace” until I went to school. A teacher asked me for my name and I said, “Menace.” That stopped it right there. Nothing I love more than fudge with a crust! It looks absolutely amazing. Fantastic idea! What a great story, Aimee! Your amazing fudge is such a wonderful tribute to your daughter. I’m glad this story makes you laugh now! Oh my word! That’s one of those stories where you don’t know whether to laugh, cry or yell. But it makes for great memories 🙂 And this fudge is so pretty and that crust looks so good! My heavens! Kids can be so mischievous. But those moments stick with you and become such great memories. This fudge is also great. I can’t believe you made shortcake fudge with a crust. It sounds divine! oh my goodness, I love that story! Tell “trouble” she would get along perfectly with my middle son! And I love this fudge, it’s perfect any time of the year! This might be the best fudge ever and that is such a sweet story about your daughter! It’s so fun to remember “hard” incidents like that and be able to laugh about them. 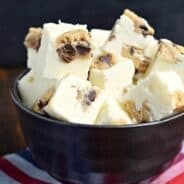 Such a great story to go along with this gorgeous fudge – and a great reminder that one day I’ll look back and laugh at the antics of my menagerie! Yes, you tend to only remember the funny things or the really really bad things…not the inbetween chaos! I’m a sucker for anything strawberry… and this recipe is definitely calling my name! These look very yummy Aimee! How wonderful is this fudge?!?! Wow, these cakes look fantastic! I’ll try your recipe this weekend! Asking my wife to cook this tonight! Looking so delicious! Oh my gosh, what a crazy story. I’m cringing just thinking about the mess! This fudge is really beautiful and so creative. Love it! These look so good. I just recently tried marshmallow cream and it was so delicious. This would be a good dessert that I’d make for my fiance because he loves strawberries. Now he would put a hurtin’ on these for real. First: crust on a fudge? Genius! 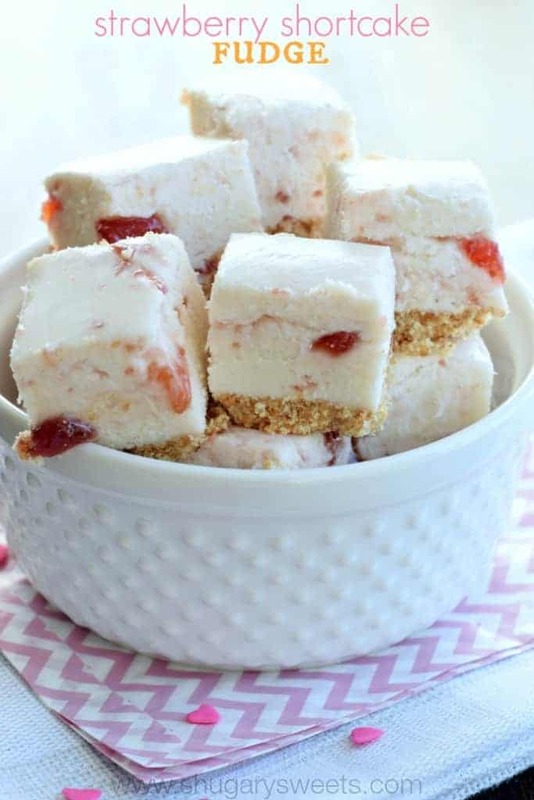 Second: Strawberry Shortcake fudge? Even MORE brilliant! I can’t wait to make this! Very cute story! I love strawberry shortcake but never thought about it in fudge form! Thanks for sharing how to make such a unique treat! 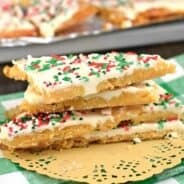 I made these for Easter and they were divine!! Well you were just a baking fool for Easter 🙂 Glad you enjoyed the fudge! Baking is my passion and I am addicted to it. Haha! 🙂 I am going to be going to collage for Baking Art. If I want to use this for the next day would you recommend continuing to refrigerate? So I tried to make this fabulous fudge a few days ago and unfortunately it was on the softer side. I am sure I did something wrong but not sure what. Any ideas? I’m not usually one for sweets, but I must say this was delicious! And of course the kids devoured it. Glad you all enjoyed it 🙂 Have a great day!! I’ve never seen ‘non-chocolate’ fudge. This was a MUCH more flavorful and healthier alternative. Thanks! !